Hello. 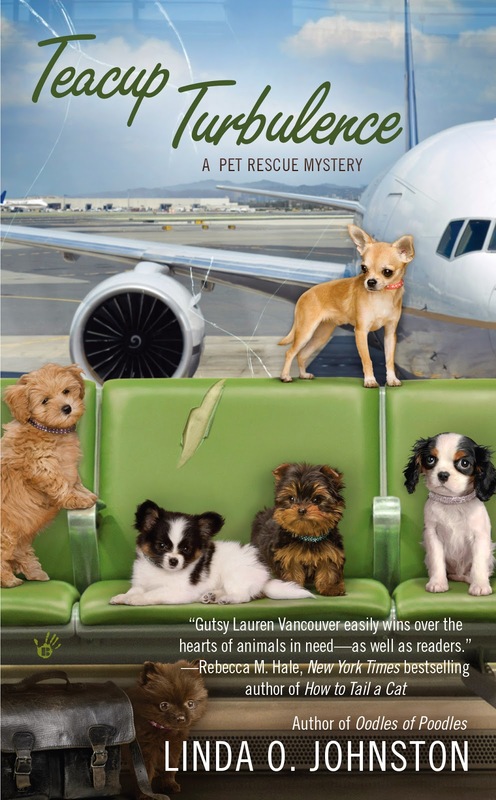 I've been wanting to chime in here and talk about how much I appreciate the very special rescues of pets, especially dogs, that are described in the book that chronicles Lauren Vancouver's latest adventure, Teacup Turbulence. First, I'm Matt Kingston, and I really care about Lauren. I am an official with L.A. Animal Services, and I supervise a number of teams that are involved with saving animals in danger. Since I met Lauren, I've appreciated all she does to help pets, and not just by rescuing them, taking them to her excellent no-kill shelter HotRescues, and finding them new homes. She's gotten involved in other kinds of things relating to saving animals, everything from puppy mill rescues to unofficially supervising how animals are treated while being filmed for Hollywood movies. I can't say I'm thrilled that she's also gotten involved with solving murders that are somehow related to her rescue ventures. I worry about her. And now it's happened again. Teacup Turbulence involves the previously unheard of situation in which people were clamoring to adopt small, teacup-sized dogs in the L.A. area. Usually, we have too many of them around here and those of us at L.A. Animal Services sometimes scramble to find private shelters to take them in and save their lives. In this case, the reason was that Lauren's friend and benefactor Dante DeFrancisco aired a bunch of ads on television and outdoor advertising that showed his pet-supply company HotPets' latest product, special HotPets Bling decorative dog collars, worn on small dogs. Suddenly everyone wanted to adopt the smallest canines. I kept track of how many were adopted from the public shelters, since I work there. Lots! In fact, we ran out of small available dogs. Then Lauren told me about hearing of a rescue from a Midwest puppy mill where there were too many teacup-sized dogs and not enough adopters. Dante and she recruited one of the excellent groups that moves pets from areas where no one wants them to places where they can be rehomed quickly. In fact, one of Dante's employees flew planes like that. As a result, lots of little dogs got brought here and rehomed by Lauren and saved! But, darned if there wasn't a murder involved with that situation, too. So, yes, I worried about Lauren once more getting involved and putting herself in danger. I spent as much time with her and Zoey--her own rescue dog whom I'd happened to find for her--and my dog Killer that I could. Fortunately, Lauren came out of it all okay. And I appreciate her all the more for caring enough to help not only pets but friends in difficult situations. Flying dogs? Not us, thank you! Chasing bird shadows is as close as we'd like to get!